GRAPELAND – It’s that time of the year again and once again health officials are urging people to get prepared. Flu season is upon us and especially for senior citizens and young children, it’s time to take preventative action. One of the best defenses against the influenza virus is the time honored tradition of the flu shot. 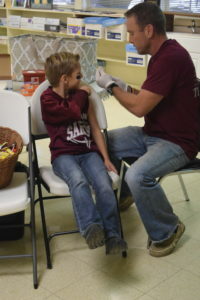 While getting yourself or your little ones to a doctor may be a hassle, in recent years, Grapeland ISD Board of Trustees Member Melissa Cobb has helped Grapeland Elementary School students stay in school and out of bed with the flu. 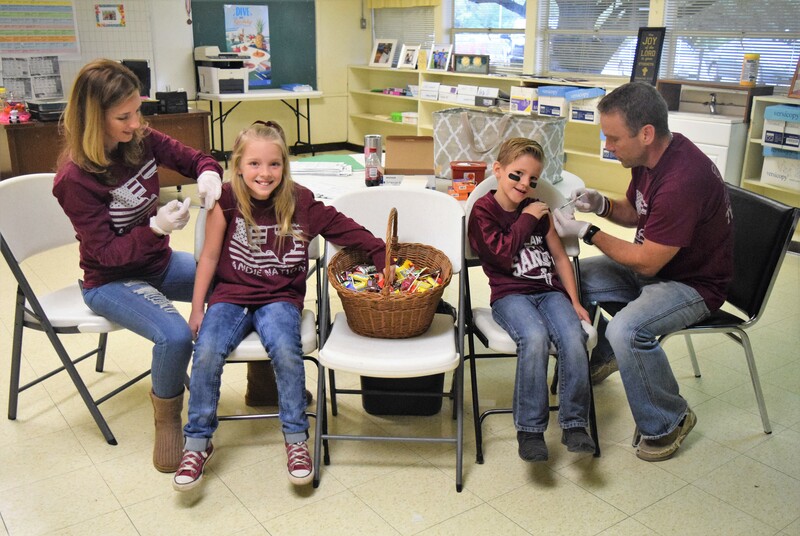 Since 2012, Cobb – a family nurse practitioner – has provided and administered the flu vaccine to Grapeland Elementary Students who have received their parents’ permission. On Friday, Nov. 9, Cobb took time to speak with The Messenger about Grapeland Elementary’s flu vaccination program. “I started doing the vaccines in 2012. I did this to ensure the kids were getting them. We live in an underserved population and yes, a lot of kids could probably get this under their parents’ insurance,” Cobb explained. The flu has a type of domino effect, Cobb added. If a child comes down with the flu, a parent has to take off time from work and then the job suffers. “We do over 100 vaccines every year. Last year was a good test year for us. I pulled some numbers because we had that huge flu epidemic. A lot of people were saying the flu vaccine was not effective. There were schools that had to close down for a little bit because they had such high absentee rates. I pulled some numbers from here and we really never had a dip in attendance because of the flu. Out of all the kids we vaccinated last year, we only had two who came down with the flu, but they didn’t come down with severe cases,” she said. Funding for the program, which is free to the students, is always an issue. According to Cobb, the average cost of a vaccination is $16. When you factor in the syringes and everything else that goes with it, the yearly price is almost $2,000. Cobb said the financing for this year’s vaccinations came from the Grapeland Noon Lions Club, the Grapeland Hospital District along with James and Carol Martin from Davy Crockett Drug Co.
She also tried to alleviate any concerns parents might have in the future as the vaccination program continues. “The vaccine is no longer a live virus. The vaccine that we are administering is a quadrivalent so it protects against two Type A’s and two Type B strains of the virus. Of course, that can mutate and change from year-to-year. We are giving the best protection we can and we will always be gentle with their kids,” Cobb said.